Or more particularly let’s talk about tax and companies. Well dear readers what a week it has been in the Beltway. Secret recordings down south and secret payouts from Wellington. All the more bizarre as – Mike Williams confirmed – MPs staffers pretty much have sack at will contracts. If your MP doesn’t like you – that’s it you’re out. No lengthy performance management for them. Facepalm. So maybe this factoid could get added to new MPs induction? But as always the key issue gets missed. Exactly who under 40 years old knows what a dictaphone is? And into this maelstom Inland Revenue released a paper on taxation of individuals and some stuff on debt. Both worthy topics of discussion. But then Ryman released its results. And their CEO said like tax is paid – just not like income tax and just like not by them. So after last week’s post I thought I’d have a look. Oh yes the real tax is very easily found in the Income Tax Note. Tax losses of $28.9 million in the 2017 year. Up from last year when they were only $15 million of losses. They are a growth stock after all. Quite different from the tax expense which was $6m tax payable. To your correspondent this looks awfully like her specialist subject of interest deductions for capital profits. All mixed up in a world where interest expense isn’t in the P&L but instead added to the asset value. Complying with both accounting and tax. And yeah totes a tax loophole but one from like whenever. And again in Ryman’s accounts the rent equivalent from the time value of money of the occupancy advances is in neither the accounting nor the tax profit. Because reasons. Now expecting controversy the CEO front footed the issue saying that the shareholders paid tax and that Ryman had actually paid GST. He then also referred to the PAYE deducted as they were employers. Kinda going to ignore that bit tho coz the whole claiming credit for other people’s tax really gets on my nerves. And I’ll take his word on the GST angle coz I am cr@p at GST. But with his shareholders paid the tax comment – he is talking about imputation. And as I haven’t covered that before dear readers – today you get imputation. Oh and other random thoughts on tax and companies. Now the official gig about imputation is how – notwithstanding that they are separate legal peeps – the company is merely a vehicle for their shareholders to do stuff. So for tax purposes the company structure should – sort of – get looked through to its shareholders. And this means dividends are in substance the same income as company profits and so should get a credit for tax paid by the company. And as a tax person this stuff is considered to be in the stating the flaming obvious category. But as I am no longer an insider – I am increasingly finding it interesting just how public policy on companies manages to talk out of both sides of its mouth. And how – much like the sack at will contracts or milliennials using dictaphones – no one has noticed. On one hand we have the Companies Act which sets up companies with separate legal personalities from its shareholders. Meaning that if you transact with a company and it doesn’t pay you. Bad luck bucko. Nothing to do with the shareholders. 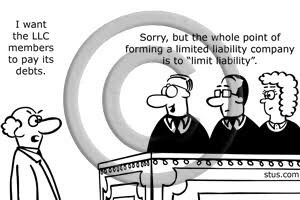 Limited liability; corporate veil and all that. But for tax if you only have a few shareholders those losses can flow through to the shareholders and be offset against against other income. The negative gearing thing but using a company. Coz in substance the company and shareholders are like the same. And a similar thing happens with the Trust rules. Trust law says that it is trustees that own the assets. And once you have handed stuff over to them as settlor – that’s it – that stuff isn’t yours anymore. So if that settlor owes you money – also bad luck bucko. Don’t for a second think you can approach the trustees – coz whoa – settlor nothing to do with them. But then tax says – for trusts – as settlors call the shots; it’s the residence of the settlor that is important. Mmmm. This means that a trust with a New Zealand resident trustee and a foreigner wot gave the stuff to the trustee – foreign trust – isn’t taxed on foreign income. Coz that would be like wrong. Even though the assets are owned by a New Zealand resident. And New Zealand residents normally pay tax on foreign income. Right. Awesome. Thanks for playing. Now put any thoughts of separate legal personalities outside your pretty heads dear readers and think substance. Think companies are vehicles for shareholders. Don’t think about small shareholders having no say or liability if anything goes wrong. Just think one economic unit. And then you will have no problem seeing potential double taxation if profit and dividends are both taxed. Coz #doubletaxationisgross. So as part of the uber tax reforms in the late eighties imputation was brought in. Tax paid by the company can be magically turned into a tax credit called – imaginatively – an imputation credit which then travels with a dividend. Creating light and laughter in the capital markets. Or as I have put to me – increased inequality. As when imputation came in it gave dividend recipients – aka well off people – an income boost courtesy of the tax system. Probs also a tax free boost in the share price too. Now putting aside such inconvenient facts – your correspondent has always defended imputation. Because in order to get the light and laughter or increased inequality – companies actually have to pay tax. And of that – big fan. But all of this is only useful if shareholders are resident. Coz the credits only have value to New Zealand residents. And this is kind of why foreign companies may not care about paying tax here. And did I mention tax has to actually be paid? And this last point that brings me back to Ryman’s chairman. He is right. If the company doesn’t pay tax – then the shareholders do when a dividend is paid. So honestly what are we all getting excited about? Well – profits have to be like actually distributed before that happens and shareholders have to be taxpayers. And Ryman distributes less than 25% of their accounting profit. And the residence of shareholders? Who knows. Lots of nominee companies listed which could mean KiwiSavers or non-residents. Oh and Ngai Tahu. Who seems to be a charity. So yeah maybe. Some tax will be paid by some shareholders. That is true. Let’s hope it exceeds the tax losses Ryman is producing. 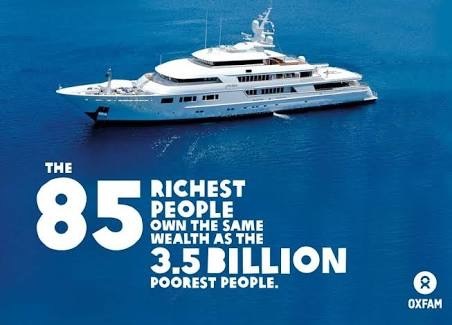 Or more particularly let’s talk about Oxfam’s recent press release on inequality and tax. Now dear readers when I moved to weekly – hah – posting it was because this blog was supposed to be my methadone programme. Getting me off tax and on to other issues. So when I posted last night – after having posted 3 times last week – I gave myself a good talking to. This had to stop. One post a week was quite enough to keep the cravings at bay. To continue in this vein would risk a relapse. But this morning while I was getting dressed my husband came and turned on the radio. Rachel LeMesurier from Oxfam was talking about inequality and then she talked about tax and then Stephen Joyce came on and then he talked about tax and then he talked about BEPS. Just one more little post won’t hurt I am sure and I’ll cut down next week honest. Oxfam has compared the wealth of 2 New Zealand men Graham Hart and Richard Chandler to the bottom 30% of all adult New Zealanders. Now the inclusion of Richard Chandler seems to be a rhetorical device as from what I can tell he hasn’t lived here since 2006. So very unlikely to be resident for tax purposes. In the interview Rachael Le M also made reference to the tax loopholes that support such wealth. So using what is public information about Graham Hart and what is public about the tax rules I thought I’d make a stab at setting out what these ‘loopholes’ are. Now first dear readers please put out of your head anything you have heard about BEPS or diverted profit tax or any of the ways that the nasty multinationals don’t ‘pay their fair share of tax.’ None and I repeat none of this is relevant when dealing with our own people. It might be relevant for the countries they deal with but not for New Zealand. I am hoping that officials will also explain this to new MoF Steven Joyce as when he came on to reply to Rachael – he talked all about BEPS. Face palm. Graham Hart is a serial business owner. Buying them sorting them out and then selling off the bits he doesn’t want all with a view to building up a Packaging empire. A Rank Group Debt google search also indicates that a substantial proportion of all this buying and selling was done through debt. And at times quite low quality debt which would indicate a proportionately higher interest rate. A number of his businesses are offshore. So then what ‘loopholes’ – or gaps intended by Parliament – could Mr Hart be exploiting? The first and most obvious one is that there is unlikely to be any tax on any of the gains made each time he sold an asset or business. The timeframes and lack of a particular pattern – as much as Dr Google can tell me – would indicate that the gains would not be taxable. The second is that income from the active foreign businesses will be tax exempt and any dividends paid back to a New Zealand will also not be taxed. Trust me on this. I’ll take you all through this another day. The third relates to debt. Even though it assists in the generation of capital gains and/or the exempt foreign income it will be fully deductible. Now because of the exempt foreign income there will potentially be interest restrictions if the debt of the NZ group exceeds 75% of the value of the assets. A restriction true but not an excessive one given exempt income is being earned. Now also in Oxfam’s press statement is a reference to a third of HWIs not paying the top tax rate. I am guessing some version of one and three plus the ability to use losses from past business failures is the reason. Unsurprisingly Eric Crampton of the New Zealand Institute is not sympathetic to Oxfam’s views and points to our housing market as the main driver of inequality. So then in terms of tax and housing the other tax ‘loophole’ then would be the exclusion of imputed rents from the tax base. Now one answer could be Gareth’s proposal. That is if someone could explain to me how to tax ‘productive capital as measured in the capital account of the National Income Accounts’ in a world where tax is based on financial accounts according to NZIFRS. The second could be a capital gains tax even on realisation and the third some form interest restriction or clawback when a capital gain is realised. Oh and taxing imputed rents. How politically palatable is this? Not very given National, Labour, Act, New Zealand First and United Future are all opposed to a capital gains tax – at least Labour for their first term. But then maybe it is stuff for Labour’s working group. Will be interested to see this all play out.